There’s something about focaccia that I can’t quite put my finger on. People who would normally just pass around the breadbasket at the dinner table without partaking, lunge hungrily at pieces of focaccia when included as part of the breadbasket fare. Perhaps it’s the delicious unctuousness of the surface craters filled with fragrant rosemary oil. Or maybe it’s the light, airy crumb perfectly suited to sopping up the last bit of sauce or juice at the end of a perfect meal. Either way, focaccia has become a flatbread favorite here in the U.S., perhaps second only to pizza. 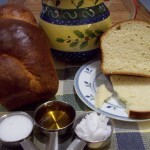 The focaccia formula used here is based on a poolish pre-ferment and is a modified version of the one described in Reinhart’s The Bread Baker’s Apprentice. The focaccia dough is extremely wet (~75% hydration) and contains a fair amount of olive oil, making focaccia dough one of the few doughs that I mix using a stand mixer. The high hydration also necessitates the use of multiple folds after mixing to properly develop the gluten. Prepare the poolish the night before baking by stirring together the flour, yeast and water until the ingredients in the bowl are well incorporated. Cover the bowl with plastic wrap and let sit at room temperature until the poolish becomes bubbly, about 3 hours. Immediately place the bowl in the refrigerator and let the poolish ferment there overnight. 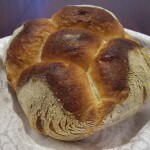 The next morning, remove the poolish from the refrigerator and let warm to room temperature for 1 hour. Add the water and poolish to the bowl of a stand mixer and mix on low speed with the whisk attachment until the mixture is homogeneous. With the whisk still going, add the olive oil and continue mixing until the oil is incorporated. Switch to the paddle attachment, add the flour, yeast and salt, and mix on low speed until all the flour is hydrated, about 2-3 minutes. 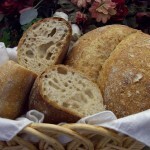 Increase the speed to medium and mix until low to medium gluten development is achieved, about 5 minutes. Let the dough ferment for 1 1/2 hours at room temperature, repeating the dough folding at 30 and 60 minutes. After this first fermentation period, the dough is transferred to an oiled baking sheet and olive oil is brushed onto the surface of the dough. Using fingertips, the dough is then gently eased to the edges of the baking sheet, trying to maintain an even thickness throughout. If the dough becomes too elastic during this step, let the dough rest for 5 minutes, then resume. Sprinkle the surface of the dough with fresh, coarsely chopped rosemary, lightly cover with plastic wrap, and let ferment a second time for 1 1/2 hours. After this time, sprinkle additional olive oil over the surface of the dough, dimple the surface with fingertips, and sprinkle the surface with kosher salt, to taste. The focaccia is baked in a pre-heated, 450°F oven for 20 minutes, rotating the pan 180° after the first 10 minutes to ensure even baking. 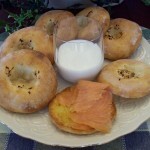 The pan is removed from the oven and the focaccia is removed immediately from the pan and allowed to cool on a cooling rack for at least 20 minutes before cutting into slices. I admit that I have never, ever made focaccia before because I have never thought it looked that great. OK, is that a cultural thing? But your description sounds very nice and I may just have to try it. Your video was great as usual, though since you continue to be so silent, I couldn’t help laugh at all the other sound, water splashing and gloopy dough. I’ll let you know what I think when I make it, promise! I look forward to hearing of your first experience with focaccia. 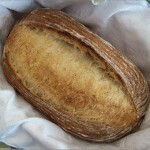 Gorgeous light and airy crumb. Alas, I don’t have the space (or money!) in my apartment to get a stand mixer yet. I might just have to deal with the mess and do this recipe by hand. Those slices look like they were simply meant to be dipped in olive oil. Thanks for a beautiful and informative post. Claire, if you do attempt the entire focaccia recipe by hand, I would suggest trying the double hydration technique described in the post on ciabatta. 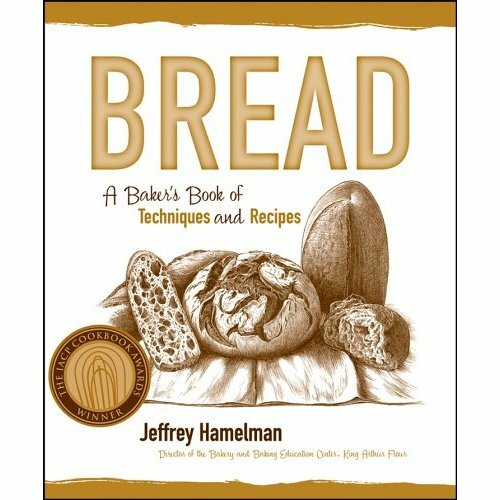 This will allow you to more easily develop the gluten before the dough becomes very wet. What is the temperature of water for the poolish and the final dough, respectively? Thanks. Please see my response under the “Ciabatta using Double Hydration” comments. Thanks for the recipe. I made it for Thanksgiving and it was great. My husband especially loved it since I over did the salt on it. Jenny, I’m glad the focaccia was a hit with your family this Thanksgiving. 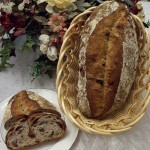 Take a look at the post on cherry pecan bread for another idea for the holiday table. I challenge everybody to make this. I am sure many people read this and think it too daunting, or time consuming; but this is a brilliant recipe and the technique is easy. 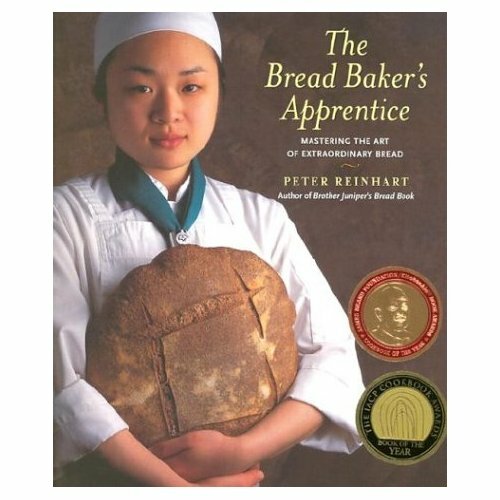 I have had a love affair with bread making for decades, and this site is better than ‘any’ book I have in my possession ( and some of them are advertised on these pages) for both recipies and technique. Thank you so much Steve for sharing your passion. Chris, your comments are very much appreciated. 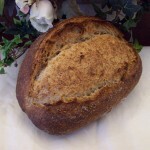 From the outset, I’ve envisioned this blog as a kind of bread baking “e-book”, where the techniques and recipes would be accessible to everyone, all for the price of an Internet connection. Wow Steve, your Focaccia looks perfect! Another very well done and informative presentation. Do you get a crunchy or crispy crust with this? Thanks, Eric. Focaccia is one of the few bread where I actually prefer a soft crust. The surface coating of olive oil keeps the crust soft and fills the surface indentations with little pools of rosemary-infused oil. Now you’ve got me wanting to bake some more! Have you seen or tried the process where you mix a little water with the top oil as well as you can whisk it together? Pour it on the surface as normal. I read that somewhere but haven’t tried it. Eric, I’ve never heard of using an oil/water suspension to coat the surface of focaccia. What would one be trying to accomplish by doing so? Steve, I think the idea was to give it a little crunch but if I recall it was an Italian recipe. I’m going to try it next time I make focaccia. You are so well read on the subject I thought I would ask. I found the reference I mentioned. It sounds like it would be a good recipe otherwise. Might be worth trying. See item #9. Eric, thanks for the link. Steve, what is the reasoning behind putting the poolish into the fridge after three hours? Would it be okay just to leave it out on the counter in the kitchen? Syd, the poolish is put in the refigerator to prevent it from becoming overly mature. 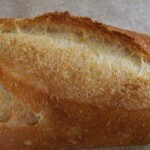 When this happens, the gluten starts to degrade and off-flavors begin to develop. If you want to leave it at room temperature overnight, I would suggest cutting the amount of yeast in the poolish, perhaps in half. Hi! I tried the ciabatta and it was a great success! 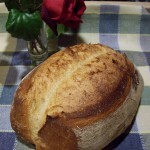 Following your methods have made bread making a lot easier and tastes a whole lot better. The double hydration method and the folding technique are ingenius. I also tried this focaccia recipe, the crumb was good but the crust was really hard and thick. Any ideas what went wrong? Also, do you have any ideas of how to keep bread crust from getting soft? Its really humid here and bread crust starts getting soft in a few hours. emilie, if you are getting a thick, hard crust, I would try baking for a shorter period of time, at a slightly higher temperature if necessary. I’m afraid it’s difficult to maintain a crisp crust under humid conditions. I actually prefer my focaccia with a soft crust. Is there a reason for only using only 565 grams of the poolish, when you make up at least 660 grams (I didn’t want to weigh out the 1/4 tsp of yeast to come up with the exact total)? Jim, the reason I made up 660 g of poolish has more to do with measuring out the yeast than anything else. If I wanted to make up exactly 565 g of poolish, I would need somewhere between 1/8 and 1/4 tsp. 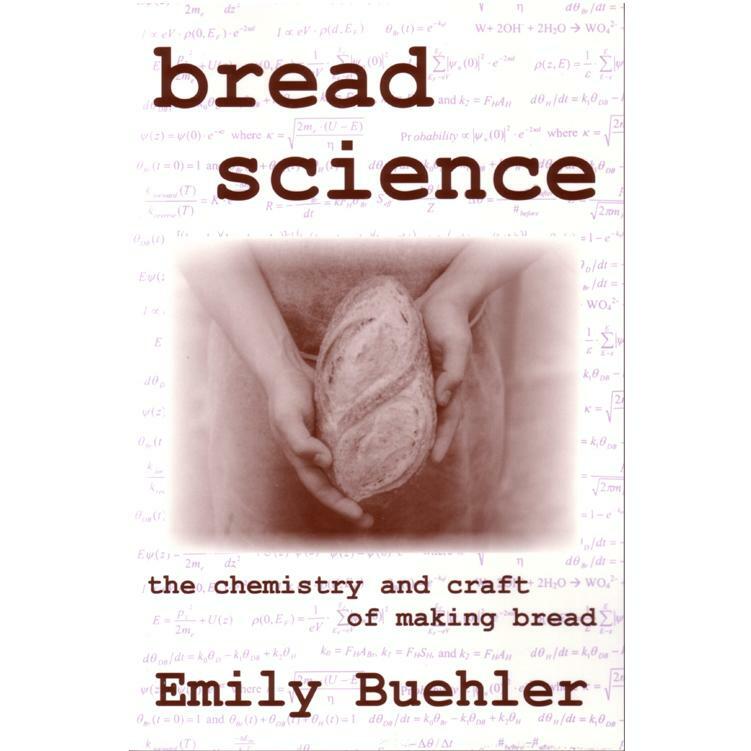 of yeast, a quantity difficult for me to measure out with any degree of accuracy given the tools at my disposal. For expediency sake, I just prepared a bit more poolish than was needed. Awesome focaccia!!!!!! 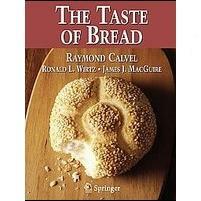 but i am just wondering the function of the poolish, is it give the different result if i mix the bread without poolish…..
Macfield, the poolish contributes to both the flavor and texture of the focaccia. You could bake a focaccia without a poolish, but it would be a different bread than the one posted here. 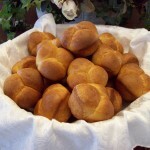 I notice you use all-purpose flour instead of bread flour as I have seen in many other recipes. Is there a reason for this? Also I assume the flour is unbleached? THis looks like a great recipe. Since there are no established standards for ‘all-purpose flour’ or ‘bread flour’, these terms really have little meaning. I tend to choose the flour I’ll be using for a particular recipe based upon its protein content. Heartland Mill Organic All-Purpose Flour, the unbleached flour I used for this recipe, has a protein content of around 11.2%. This will produce a focaccia with soft, tender crumb. Once again a mouth watering recipe. As much as i would like to try it….. i am worried about the high temperature here in Ahmedabad where i stay. The day time temperature is around 34° C indoors!! do you think one can use the same stand time for the poolish & fermentation?? Khush, temperature and the amount of yeast used both have a role in determining how long it takes for a poolish or dough to reach maturity. With the elevated temperatures you experience there in Ahmedabad, try slightly decreasing the amount of yeast in your poolish in order to maintain the resting times specified. Adding a small amount of salt to the poolish will also moderate its activity. I have been searching for focaccia recipes for a while now I am after a soft crumb but crisp crust this one might just do it I will try tonight. I want to use focaccia in a commercial venture where I offer focaccia and bagel sandwiches in a sub way style from a trailer I am concerned that the dough after the folding would not handle a road trip with out delating. I was wondering if I divided the dough to portions after the folding / rest period and out them into my small trays and refrigerated overnight for the journey how much the product will change in texure and taste, obviously the bench time increases to bring it up to room temp for the final proof before baking. What are your thoughts and recommendations please. I wish I could help you but I am a home baker with no commercial baking experience. Perhaps a baking facility that instructs professional bakers, such as the San Francisco Baking Institute or the King Arthur Flour Education Center may be able to help. 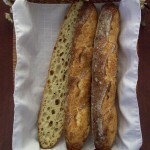 on 01 May 2010 at 10:44 pm36 Focaccia « i want seconds. I’m very excited to make this recipe but I’m working without a scale. Can anyone tell me how many cups is 565 g of the poolish? I’m sorry but since the density of a poolish is variable from batch to batch (and also dependent upon how much it has been deflated or stirred down), there really is no way to make an accurate conversion from weight to volume. At the risk of sounding presumptuous, may I suggest that an investment in an inexpensive kitchen scale might be in order? Yes, I would like to buy a scale but I’m currently living in the south of China and it’s very difficult to buy any baking equipment and ingredients for that matter. I just realized that my baking powder is in fact cornstarch! I just took my poolish out of the fridge. I figure I’ll just toss a bit of it, go on with the recipe and hope for the best! Oh my oh my is this ever good. 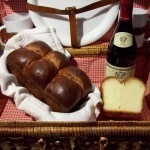 (That would be both the recipe and the bread by the way.) I love how it is shaped with fingertips, and rises without steam. 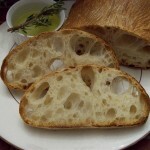 The taste is awesome I waited exactly 20 minutes before cutting a few inches off one end … warm focaccia yum! One question for you. I had a very hard time removing the bread from the pan both times. I thought it was due to not oiling it enough the first time so this second time I put on copious amounts of olive oil on the pan, if anything it appeared to stick even more. Do you have any suggestions for my next attempt? It’s best to remove the focaccia from its pan right as it comes out of the oven. 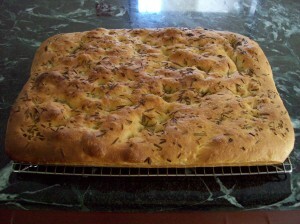 If the focaccia is allowed to cool before it is removed from the pan, it can have a tendency to stick. My dough looked a bit thinner as in the movie but the result is delicious. Thank you for your wonderful instructions. I made a couple of small errors (forgot to add the Kosher salt at the end and had the oven rack up too high) but the Focaccia still turned out great. The bottom of the Focaccia was not as brown as yours and I think that is why it stuck to the pan. Personally, I would leave the salt off but Hubby likes salt and has asked to include it next time I make it. One small change I made was to use my home made Tuscany spice mix for the seasoning instead of the fresh Rosemary. 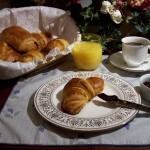 It is very tasty! Again – Thank you for sharing. Why not slice the focaccia into pieces after cooling and store half of it, well wrapped, in the freezer? 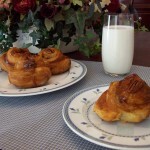 That way, you can pull out a piece or two and reheat it in the oven whenever you have the urge for a warm, savory treat! BTW: Lunch today was breakfast with eggs, baked bacon and Focaccia bread. It was very yummmmmy! Focaccia is the perfect bread for soaking up the yokes. As my first attempt at making bread of any kind (other than pizza) I tried your double-hydration ciabatta. I’ve made it twice, and both times it came out absolutely perfect. I’m trying focaccia next, but since I don’t have a stand mixer, I’ll use the same double-hydration method that you describe for the ciabatta. 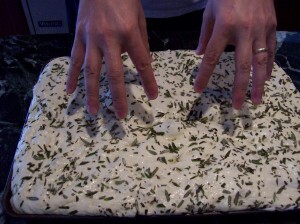 My question is about the size of the baking sheet that you use for this focaccia recipe. I’m living in Asia, and there’s not much of a choice in baking pans or baking sheets here. I can use the enamel tray that came with my oven (about 12.5 x 16 inches x 1 inch deep), but since the pan is fairly heavy, I worry that it won’t heat up rapidly enough to brown the bottom crust. Alternatively, I have fairly light-weight cookie sheets (10 x 15 inches x 5/8 inch deep). Are either of these appropriate? Double-wrapping with plastic wrap and aluminum foil would work fine. 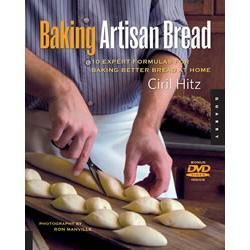 Baking a ciabatta is quite ambitious for a first-time bread baker. Kudos to you on your success! The sheet pans that I use to bake focaccia have inside dimensions of 16½” x 11½” x 1″. I would try your enamel tray first. If you have trouble with a lack of browning on the sides and/or bottom, try removing the focaccia from the tray a few minutes before the bake is complete and finish the bake on an oven rack. I just made my first batch of focaccia, using the double-hydration method, and it looks and tastes great. The main problem was that it seriously stuck to the oven tray, and much of the bottom crust had to be left behind in prying it off. I have a pizza stone that has worked very well in making ciabatta, and I’m considering using it the next time I make focaccia. I would divide the dough after the first ferment, spread the two halves onto parchment paper for the second ferment, slide the parchment and dough onto a pizza peel for transfer to the preheated pizza stone, and cook the focaccia in two separate batches. The three things I worry about for this scheme are that it could be quite messy (I envision olive oil running off the dough and onto the stone), one piece would have an extra 20 minutes in the second ferment, and the parchment paper might stick to the bottom crust and cause even more difficulties than the crust sticking to the pan. Any advice? Have you ever used a pizza stone for focaccia? If you are finding that your focaccia is sticking to the bottom of your baking sheet, I would suggest a simple solution; use more oil when oiling your baking sheet. Don’t be afraid to coat your baking sheet with a generous layer of oil. Also, be sure to remove the focaccia from the baking sheet immediately after it comes out of the oven, while it is still hot. I was able to acquire a teflon bake pan via the web, and this has solved the sticking problem. I made my second batch of focaccia yesterday, and it came out great without any sticking at all. 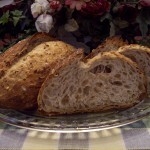 The top crust is perfect and the crumb is similar to that shown here. 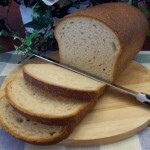 The only room for improvement that I can see is that the bottom crust (while tasting fine) did not brown much at all. Might this be due to teflon pan? To get a browner bottom crust, would you suggest a hotter or a cooler oven? Right after sending my last message, another approach for a browner bottom crust became apparent to me. Since the bread has no tendency to stick at all on the teflon pan, I could easily slide it onto the oven rack or onto a preheated pizza stone half-way through the baking. Does this sound promising? Removing the focaccia from the pan before the bake is complete and finishing the bake on a hot stone sounds like the way to go. I split the dough into 2 11×7 inch pans. Each pan had a different seasoning. One was the Tuscany seasonng and one was rehydrated Roma tomatoe pieces, Shatake mushroom pieces, garlic and Italian spices. I must say that this will be a household standard for some time to come. 2. 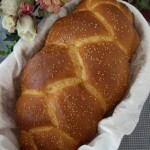 I assume this recipe makes 2 breads, if i wanted to make only one, can i half it? The recipe is scaled to produce a single, home baking sheet-sized focaccia. That being said, there shouldn’t be any problem with you scaling the recipe to whatever quantity of dough you wish. Is it possible to make this focaccia with whole wheat? 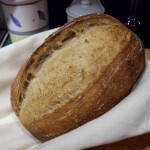 Without meaning to sound snarky, I would say that virtually any bread can be made with just about any flour as long as the baker realizes that the original characteristics of the bread may not be maintained (n.b., bread purists may also insist upon calling the new bread by a different name). If you wish to bake a focaccia using whole wheat flour without changing the essential character of the bread, my personal preference would be to use no more than about 5% whole wheat flour in the formula. Great recipe. Made a half batch tonight for dinner and cooked it up in one of my rectangular pizza pans. 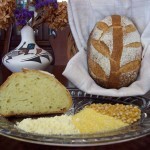 The wife was really happy with the taste and crumb, and such a delicious olive oil flavor throughout. Though I may have gone overboard when panning the dough with the oil. Thanks again! 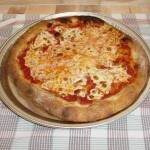 I transformed your wonderful recipe into a pizza. No sauce, just some of my favorite fresh herbs, a few veggies and some cheese. I left plenty of “edge” because I figured correctly the add ons would collapse the center. It turned out amazing! 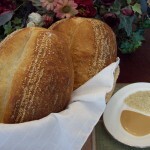 The center crust was soft but not soggy and the edge was light as a feather and heavenly. I will be doing this again soon. But maybe next time just opt for the unadorned focaccia. Now that I’ve discovered your great site, I plan on being a regular visitor. Thanks so much! 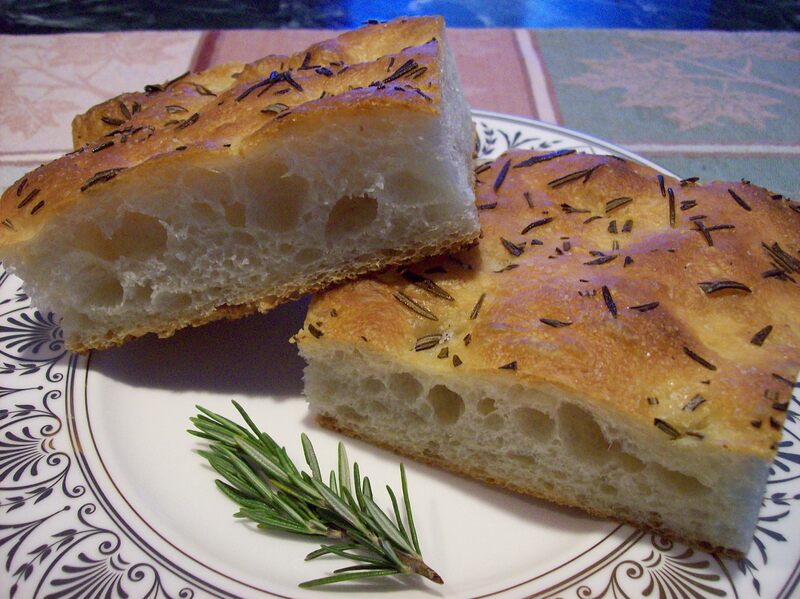 Going to a friends house today and wanted to bring a special treat … of course I thought of your Rosemary Focaccia! It is in the oven as we speak. Just about to give it it’s half turn and wow does my kitchen smell wonderful. 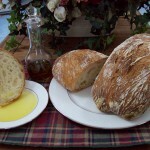 Rosemary, Olive oil and fresh baked bread. Not sure if there is a better combination! Thanks for sharing it and keeping the blog going! Just finished my first bite! It was a long process but absolutely the best bread I have ever made AND the best Focaccia I have ever tasted! Thank you so much for sharing. Wow! This came out amazing. 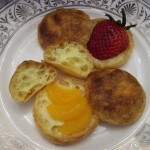 I baked it this afternoon. We used a rosemary/calmetta olive flavored oil along with som sun-dried tomato oilve oil on top. Thanks for the fantastic recipe! I’m just double-checking that you really meant to mix the dough with the wire whisk (whip) attachment. 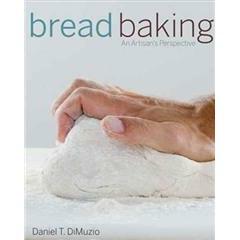 I’ve never seen any recipe suggest mixing the heavy dough with the thin whisk nor, after that, to knead with the paddle. You didn’t mean mix with the paddle and knead with the dough hook? Is there some reason to not use the dough hook at all? I’m just being cautious before proceeding- I don’t want to break my machine! The wire whisk is used to mix and aerate the initial poolish, water and olive oil mixture. This mixture is quite watery and will not harm your whisk in any way. You’ll note that the whisk is changed to a paddle attachment before any flour is added to the mixture. Hi Steve, Thanks for your quick response- I am actually waiting for the poolish to come up to room temp right this minute! I read your mixing #2 topic last night and realized you were serious about the whisk! But in that post, you do switch to the hook later. Would you just clarify that in this dough you don’t use the hook at all? I am using a Kitchenaid 600, not a DLX or anything heavy duty- not sure that would be a factor. 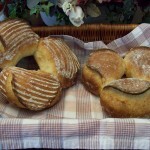 The dough hook is not used for the focaccia formula described above. My first try at Focaccia. My dough was much more liquid than yours. it was difficult to fold it. Not sure why. 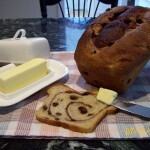 Made a much thinner bread too. Better luck next time I guess. I don’t have a stand mixer so I used a hand mixer to mix it. 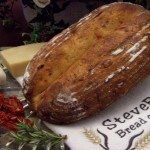 Hi Steve, OMGOODNESS My husband LOVES Focaccia. Cant wait to bake him a loaf or two. Your recipe sounds sooo wonderful, and from all the comments it most likely IS wonderful. 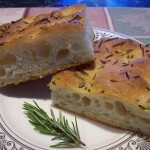 My one question, my husband loves Focaccia with a thicksh hard crust and airy inside dough. Can you give me any hints on how to archive the thick crusty crust?? I will let you know how this comes out when I bake your recipe. 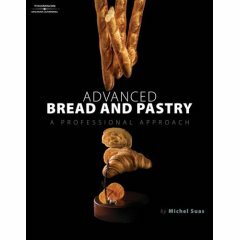 My hints on achieving a thick, crispy crust and open crumb structure? Follow the recipe! 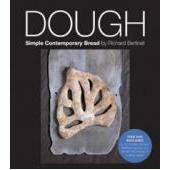 Am starting a focaccia dough this afternoon. 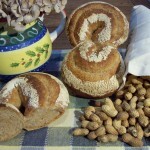 I generally use a family recipe from southern Italy (Puglia) and usually start with a biga at 60% hydration. I’ll try incorporating or adapting your recipe and technique for this batch. My question, however, is this. Our recipe includes the addition of one small/medium potato that’s been peeled, boiled and “riced”/mashed. Your recipe does not use the potato. What would you think is the effect adding or omitting the potato on the crumb & crust of the finished focaccia ? Look forward to your comments and opinion. Thanks. 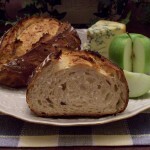 I would think that the addition of a small, riced potato would have a minimal effect on the crust and crumb of focaccia made using the recipe in this post (assuming the hydration has been adjusted for the potato), but it could add a subtle nuance to the flavor.